In Nightfall for iOS players must master hordes of ghouls, vampires and werewolves as they struggle to gain control of a post-apocalyptic world. 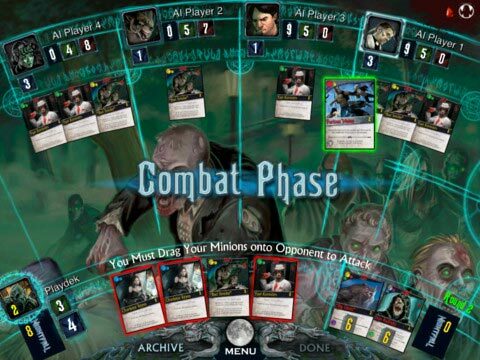 In Nightfall, Playdek’s Universal iOS incarnation of Alderac Entertainment Group’s deck-building game, players must master hordes of ghouls, vampires and werewolves as they struggle to gain control of a post-apocalyptic world. Begin with a set of starter Minions then draft cards from your private Archives, play cards into the Chain in order to maximize the effectiveness of your cards and Claim new Minions and Actions to pit against your foes. Attack your opponents every round in an effort to weaken your rivals. Time is limited and only mastering all Phases of the game will leave you standing as the victor at the end. 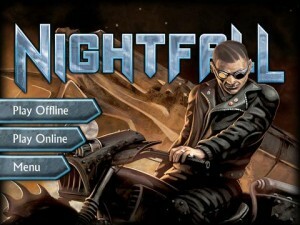 Nightfall for iOS brings AEG's modern horror game to iPhone 3Gs, iPhone 4, or iPhone 4S; iPad, iPad 2, or iPad HD; iPod Touch 2, iPod Touch 3 or iPod Touch 4. I tend to agree with much of the comments of Bryan Fischer in his review, below. The game is one of the few apps that I have played more than just a few times after purchase. Having played the real card game before playing the app, the app was easy to pick up. However, there are a number of screens that cannot be exited out of for some reason, and the other player’s cards and stats are at times hard to read. (I play off an iPhone, however, so, on an iPad, perhaps this is not an issue). While it is obvious the game is preparing for release of expansions, none of them have gone live yet, which is disappointing. I can understand why there may be some delay, because the programming required to deal with the rules changes in them is likely taking more time than planned. Once the expansions release, there should be a lot more to opine about. However, as indicated in the title, if you play the real card game, and are looking for some training time while your playgroup is away from the cards, this is a good app to consider. You can get in a number of games in a session because of the low set-up and prep times, and also, really get to see the impact of the chain strategy you have chosen. 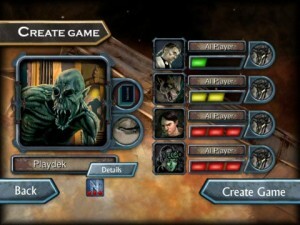 You can chose the level of difficulty, which is a nice option to ease into the more difficult strategies. I too would not recommend the app for people looking for a lot of on-line play, unless you are planning on getting your playgroup together. First and foremost, a disclosure (and apology). I’m not prone to seizures and this isn’t meant to make light of that condition. I apologize for any insult. That being said, I can only imagine that the animation in this game can actually cause a seizure. Seriously. Why did you take a card game lots of people like and make it a weird playable animated… thing. It’s still Nightfall, sure, but with animated backgrounds and constant animation flying in from all sides it is also a mess. The playing area is laid out in a semi-circle (somewhat thematic, I get it) with scrolling this and that flying across the screen and in the background. When you’re playing with 3 players or more, you can’t even see everyone’s archive but the screen still shows you the archive of the second player (this may be a bug, or it may switch depending on character – there’s so much going on with the animation on the screen that it’s easily missed either way). 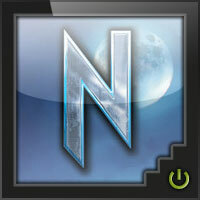 Buy this app if you like Nightfall and want to play it against the computer or in a pass-n-play way. At any given time, there are dozens of games online with no one playing them. In fact, if you join an online game, you’re probably more likely to upgrade your phone/tablet before actually playing the game with anyone. In addition, people constantly quit games when they realize they are losing. I’m not sure why, but Nightfall seems to breed this more so than in other games. The game is a bit rough to learn at the start, as with most of AEG games, but once you get the hang of it, it becomes very addicting. Add a Review for "Nightfall"